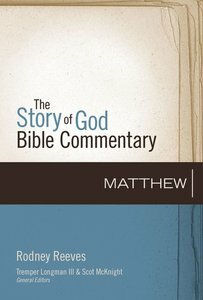 About "Matthew (The Story Of God Bible Commentary Series)"
Rodney Reeves earned his Ph.D. at Southwestern Baptist Theological Seminary and has done postdoctoral study at Oxford University. He is dean of The Courts Redford College of Theology and Ministry and professor of Biblical Studies at Southwest Baptist University, both in Bolivar, Missouri. He served previously as a pastor with churches in Arkansas and Texas. He is the author ofA Genuine Faith: How to Follow Jesus Today. His articles have appeared in journals such as Perspectives in Religious Studies, Biblical Illustrator, Southwestern Journal of Theology and Preaching.